Does It Matter That Lena Dunham Was Photoshopped By 'Vogue'? Writers at the online magazine Jezebel criticized the fashion glossy for retouching images of the Girls writer and star. Adweek's media reporter tells Here & Now that Vogue should get kudos for putting "such a real girl" on its cover. Does It Matter That Lena Dunham Was Photoshopped By 'Vogue'? 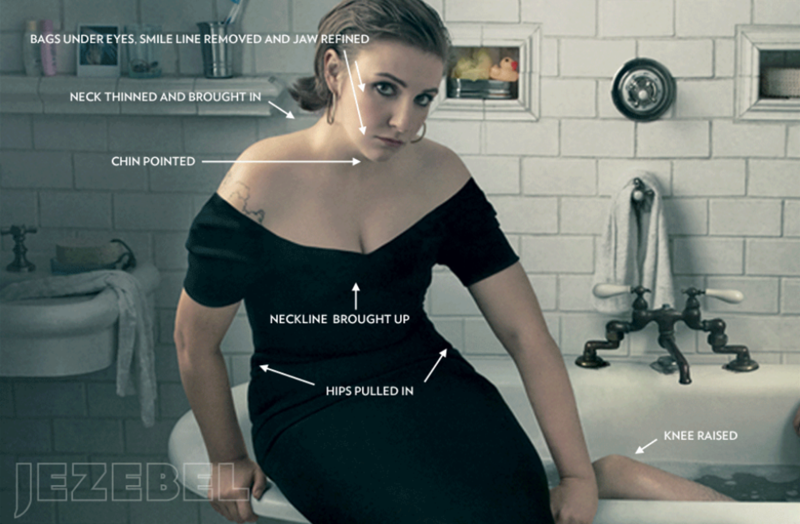 This screen shot shows Jezebel's breakdown of Vogue's photo of actor Lena Dunham. The latest round in the battle over body image, a dust-up between the upstart online magazine Jezebel and the Conde Nast giant Vogue, may be going to Vogue. Jezebel accused Vogue of digitally altering images of HBO sensation Lena Dunham, who famously insists on displaying her real, somewhat rounded shoulder and chin on her own show, Girls. Jezebel jumped on the Vogue covers, which streamlined some of those features. Jezebel offered $10,000 for the un-retouched images. "Despite the fact that Vogue did clearly Photoshop Lena Dunham, their cover girl, they're actually winning this," Emma Bazilian, media reporter for AdWeek, tells Here & Now's Robin Young. "Vogue is supposed to be this sort of fantasy version of a fashion reality, and it's really nothing that you wouldn't expect from them. And plus, they really get kudos for putting such a real girl — who's not like a size 2 model or actress — on the cover." On Tuesday, Vogue released a charming video of Dunham and Vogue European Editor at Large Hamish Bowles, made on the day of the photo shoot. Meantime, American Eagle's lingerie brand Aerie has launched a campaign called "Aerie Real," which features un-retouched models. Jezebel: Aside from the obvious lighting tweaks that any publication would make, the unretouched images are pretty perfect. Which makes some of the adjustments — slightly narrowing a jaw or raising a waistline — seem that much more unnecessary. Why bother? These slight tweaks, the "you look great, but you'd look just a little more great if..." stuff is insidious. The Daily Beast: Compared to other Photoshop jobs in women's glossies (many of which Jezebel has singled out), these were so [anti-climactic] that we can't help but roll our eyes when Coen calls them "insidious." The cover alterations were impossibly subtle, but Coen detailed the portrait's offenses against the "real" Lena Dunham in the language of a police report. Lena Dunham's response via Slate: I understand that for people there is a contradiction between what I do and being on the cover of Vogue; but frankly I really don't know what the photoshopping situation is, I can't look at myself really objectively in that way. I know that I felt really like Vogue supported me and wanted to put a depiction of me on the cover. I never felt bullied into anything ... I don't understand why, photoshop or no, having a woman who is different than the typical Vogue cover girl, could be a bad thing.